How would you like the chance to win a cash prize six days a week? Or how would you like the chance to win either a £1000, £3000 or a brand new car? - Yes ? Well you can by entering the Queen of the South lottery. For just £1.00 per entry per week you have the chance to win one of the 11 prizes up for grabs. On a Saturday one lucky winner picks up £500 while, during the week, Monday to Friday we have two prizes of £50 and a £25 to give away. For an addition £1 so £2 per entry per week you are not only entered into our Prize Draw with the chance to win 11 cash prizes, but you are also entered into our Doonhamers Deluxe Draw which gives you even more chances to win bigger prizes! The Deluxe draw which takes place monthly offers one lucky winner the chance to win £1000, with the cash prize rising to £3000 in the Christmas draw. And once a year, the monthly draw prize at the end of the season is for a brand new car along with additional club prizes. All prize money is sent out to the winners automatically so you don't even have to check if you're a winner. Alan Ritchie received an early Christmas present when he was announced as the winner of our £3000 Christmas cash prize and James Howatson received the first £1000 of 2019. Congratulations to both. It could be you next - join up now to have the chance of claiming the £1000 in February. It couldn't be simpler to enter. You can now play ON-LINE by visiting the ON-LINE STORE section of this site, offering a range of periods to play, whether it be for one month or the whole year!!! You can also enter now by downloading the application form which is available in the prize draw section, printing it and sending the completed form to the club. Alternatively we have agents across Dumfries and Galloway. Browse through our current list of agents and join as a member with them, paying them on a regular basis to ensure your entry in the draw is current. 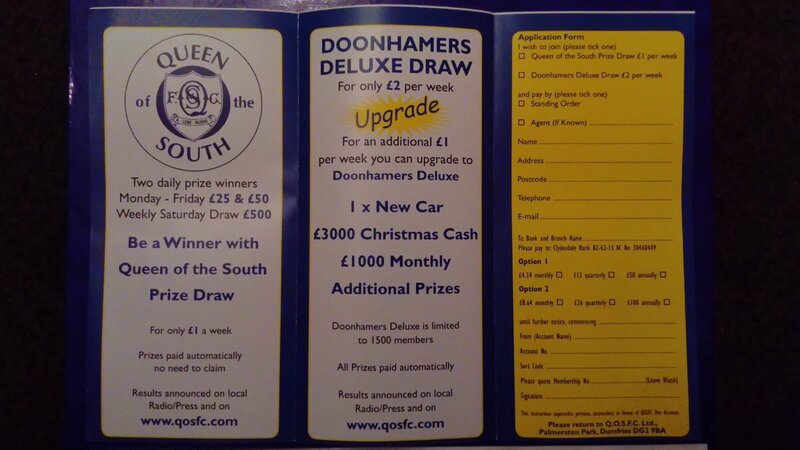 For entries on the Queen of the South Prize Draw wishing to upgrade to the Doonhamers Deluxe Draw, just let us know your membership number and we will do the rest for you.